Julchen is a play doll for children that has been created by the doll artist Brigitte Paetsch. She would look beautiful and serene being wheeled around in a pram with her eyes closed fast asleep. Pop her dummy in her mouth if she's having trouble sleeping. When she wakes up, give her a cuddle and feel the softness and warmth of her fabric middle and her the tactile vinyl of her head, arms and legs. If she's ready to play, that's great, she sits nicely waiting. Julchen's middle has some beans inside so that she can sit up. She is dressed in contemporary play clothes, that are hand washable at 30 degrees. Her face is a lively and her big eyes are friendly. 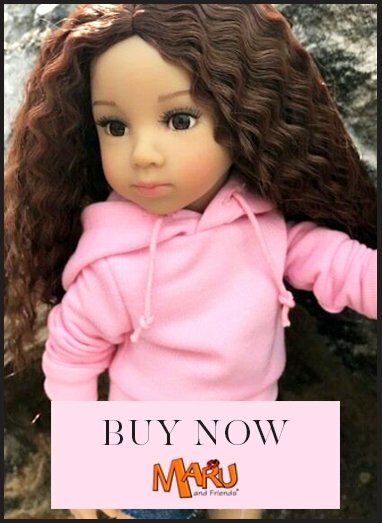 Julchen is 52cm and a popular doll for dressing in real baby clothing, mostly in newborn size, and 0-3 months. Schildkrot Baby doll Julchen is suitable for children from age 3 + but is better suited to children age 5+ because of her size.